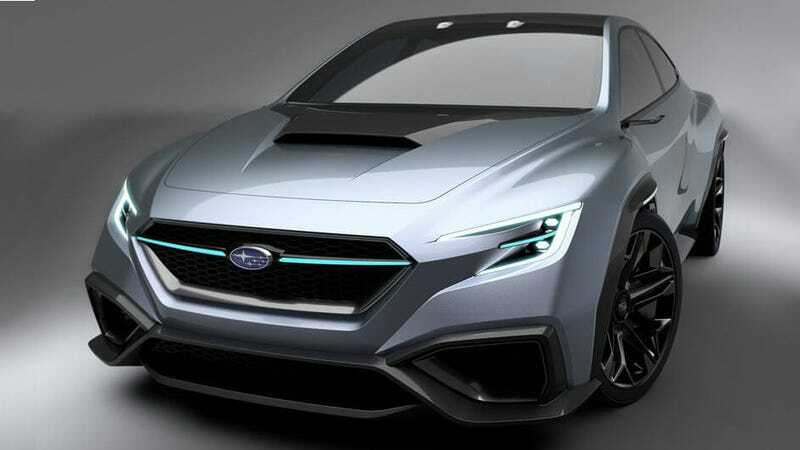 Subaru is bringing the Viziv Performance Concept to the Tokyo Motor Show as a likely preview of its plan for the next-generation Subaru WRX, which apparently includes hexagonal fender flares, a large touchscreen interface and some upgraded driver-assistance systems. The renderings and details show what Subaru has planned for everyone’s favorite all-wheel-drive nonconformist sports car looking ahead, scooped up by CarScoops from Wheelsage ahead of the vehicle’s official reveal. The great news is that the symmetrical all-wheel-drive, boxer engine and hood scoop are all returning in a package featuring some upgraded design flourishes that follow the trend of WRX generations getting more and more attractive as they evolve. While I hate the squared-off fenders that Chevrolet seems to tack on everything these days, Subaru’s hexagon fender approach here fits the attitude of the car and I dig it, along with the more aggressive rear shoulders and the connected taillight treatment. All-in-all, it’s a nice evolution of the current look. There’s not much technical detail available for the concept, but it reportedly has a boxer engine and all-wheel-drive, an updated Subaru EyeSight driver-assistance system, and if we peek through the rendering’s windows, you get a glimpse of a rather large infotainment screen that’s likely of the touch-me-to-operate variety. The only thing I’m not liking is the neon blue coupled with practically-silver paint job, which I’m sure later concepts for the STI version or whatever will remedy. We’ll get more pictures and details of this one when it’s officially revealed.